This is a page for Monkey Queen things that really don’t fit onto any other page. They’re not essential reading, but they’re fun nonetheless. YA Spring Fling Interview: Early in 2015, I was interviewed by fantasy author Sarah Dalton as part of a blog hop for a book promotion. The interview appeared on a third web site, but it was truncated, so I ran the original uncut interview after the promo had ended. Behind The Scenes – The Secret Origin Of Beth McGill and Behind The Scenes – How Michiko Got Her Scarf: Two “process posts” on the development of the main characters, featuring early art by Willow. 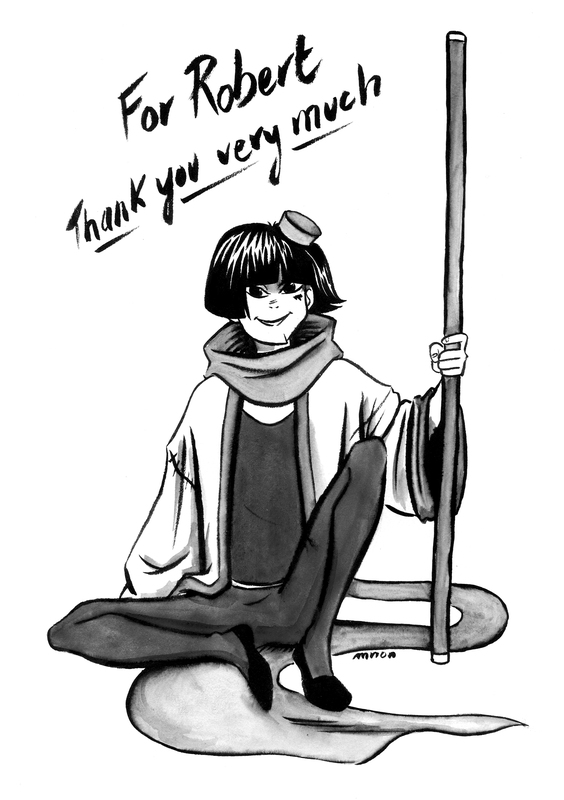 Fan art of Michiko by Marion LeBlanc, creator of the comic “The Old House On Lewis Street”. © 2015 Marion LeBlanc.